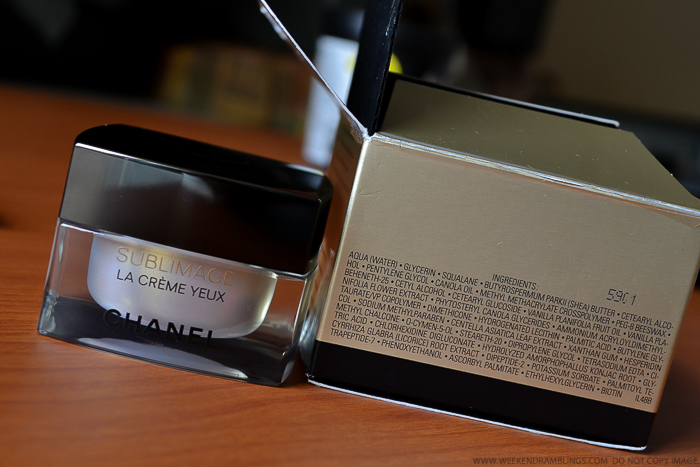 As is invariably the case with most luxury skincare brands, Chanel Sublimage eye cream too is housed in beautiful packaging. The cream comes in a glass jar, and a small plastic spatula is included to help apply the cream. The heavy glass jar feels quite luxurious, and I am sure I would want to hoard the jar once I am done using the cream, but honestly, I much prefer the tube packaging that the samples come in. It might not scream luxury, but it does seem like cleaner packaging. Use the equivalent of a grain of rice for each eye. Delicately apply to entire eye contour, including eyelid. Gently pat, then smooth from the inner of the eye outwards. After applying the cream, gently stimulate the fine skin under the eyes by gently pinching with fingertips for several seconds. This improves the effectiveness on puffiness. 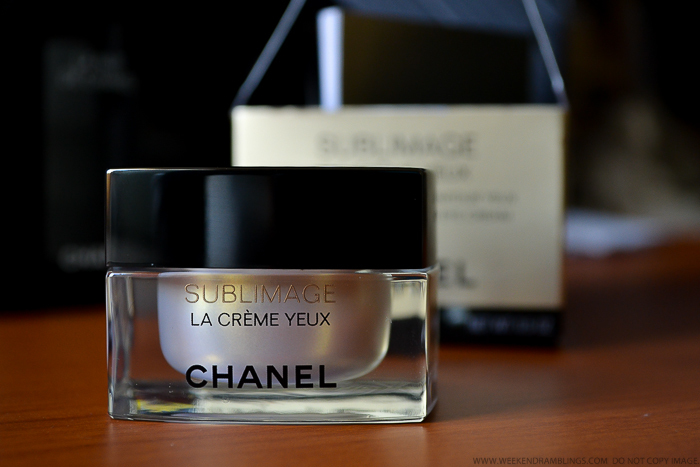 Chanel's Sublimage line targets signs of antiaging, and the eye cream claims to work against wrinkles, puffiness, and dark circles. 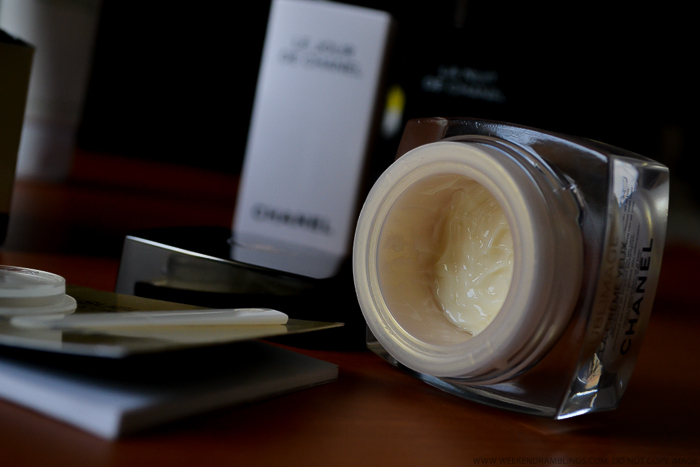 It's a rich cream, and Chanel recommends using a very small amount - the size of a rice grain - for each eye. I find this quantity more than sufficient, and this small jar has lasted me a long time (shelf life is mentioned as about 6 months, though). Applying eye cream can be quite a ritual in itself, but I just warm the cream between my fingers and dab it on to my eyelid and undereye area. The cream absorbs easily into the skin, and if used as recommended, I don't find it oily at all. As for how effective the cream is, I find it a really good basic eye cream. I have not noticed any change in the creases and wrinkles that I do have, but it does a good job of moisturizing the skin around my eyes as well as giving it a bit of a well-rested and brightened look. It's only recently that I have started using an eye cream on a regular basis, and it would take a major miracle to erase any damage that has already been done, but this cream does seem to reduce some of the darkness and generally keeps skin looking healthy. I haven't been a big believer in the whole eye cream philosophy. I have always felt any good, basic moisturizer with a simple ingredient list would work just as well around the eye area. Add to it the fact that most eye creams I have tried so far - and I have tried quite a few - haven't done anything at all. The caffeine-containing depuffing ones just seem to make my underye area dry, and don't even get me started on those "brightening" ones that have shimmer and pearl mixed in! My requirements from an eye cream (or even a face moisturizer) are pretty basic - keep my skin feeling moisturized, and the antiaging bit will work itself out. 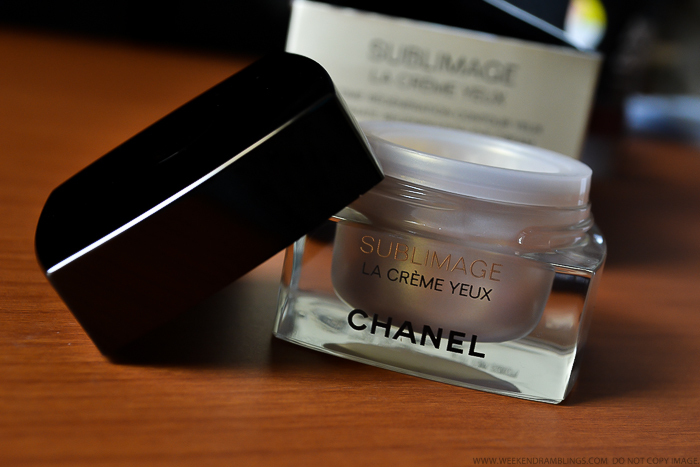 Chanel's Sublimage eye cream has been the only eye cream that has managed to do that for me, and I am willing to embrace the "use-an-eye-cream" theory so long as my skin looks healthy. If you have an eye cream you are happy with currently, you really don't have to rush to a Chanel counter to buy this. 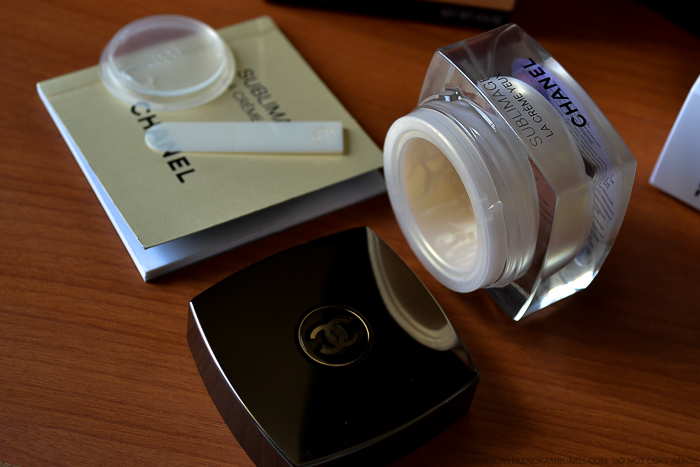 If you are interested in giving this Chanel eye cream a try, I would definitely suggest trying out a sample before buying since this is a pricey product. Oh my friend loves that one..it's such a smallllll dabba na? I don't knoww...I just feel with cream..each person's requirements are different, and I don't really know if going by what really suits an age group would work..at least for me it doesn't. I too didnt believe much in eye creams until I came across the clinique one! I have used hell lot of eye creams and most of them didnt do anything for my dark circles! Clinique all about eyes the gel version works really well for me, have been using for 1.5 months n my eye area looks much better, well rested and even brightened a bit, i have horrible dark circles and partly due to genes and nothing till now have worked but clinique has definitely reduced the intensity of the dark circles...of course I dont expect them to disappear but pretty happy with the result as of now :) Oh and I have extremely dry skin around eyes and this one works well..I too tried the FE one but it didnt do anything plus its quite tiny for the price! Nice! Your blog is like a Chanel directory! Sneaky suspicion.... Banglorean on foreign shores?? ?